I'm sure all of us have several cookbooks full of good recipes, but we're looking at our favorite recipes with prepping in mind. During a crisis, there will be no trips to the store; we will need to cook with whatever is in our pantry or storage. Like many of you, I often cook with soup, chicken, or some vegetable or fruit from cans purchased at the grocery store or my own canned/bottled supply. Canned foods are a must-have in my storage plans. But sometimes we don't have a can of some food, or a particular food doesn't even come in cans, or the recipe calls for a fresh food. That's when we need to be creative and flexible. Find a substitute for the recipe ingredient with another food that will be healthy as well as tasty. Use the following chart to give you an idea of what to substitute when fresh ingredients are not available. Most of us probably store white sugar. It's easy to store and will last indefinitely. Try these substitutions if all you have is white sugar and your recipe calls for other types of sweeteners. 1 cup Honey 1 ½ cup granulated sugar plus ¼ cup water OR 1 ½ cup Honey Crystals plus 6 T. HOT water. In my opinion, no food storage plan should be without freeze-dried foods. Not only do they last 25 years or more, but with a little hot water, they provide the same vitamins, minerals, and flavor that fresh foods can provide when they are available. 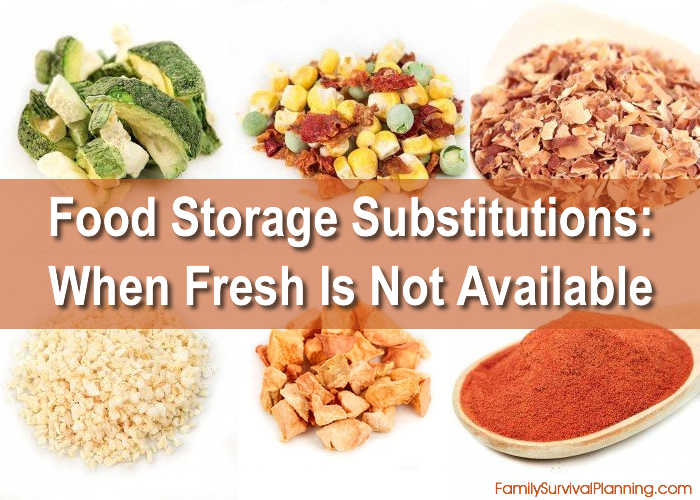 If you want to change your attitude about surviving on only your food storage, learn how to use freeze-dried foods in your regular recipes. You might be surprised how good they are! There are even more varieties of fruits available in freeze-dried form, including many tropical kinds that will not grow everywhere, such as mango, pineapple, and bananas. We usually buy eggs and dairy products on our weekly grocery store trips because they are considered perishable and need to be refrigerated. But what if in a crisis and you need an egg, or milk for the breakfast cereal? Not to worry — there are freeze-dried varieties that are just as good or nearly as good as the fresh. And, they will last 10-25 years. What is the ratio of fresh foods to dry? If you're in the middle of preparing dinner with a favorite recipe, how do you know how much dry food to used in place of fresh? It depends on the type of food, but here's a chart to give you some idea of how much to substitute. Keep in mind, however, that it does depend on the type of food because some foods expand more than others when reconstituted, but there are instructions for preparing freeze-dried or dehydrated foods on the can.